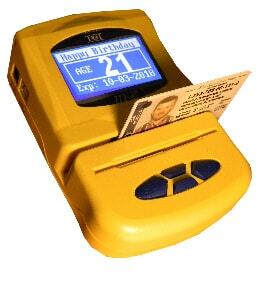 The ID-e2001 Reader is the most versatile Age Verification or Data collection terminal you can own. ID-e give the user total Mobile portability and all Magnetic strip or 1D & 2D capability in one package. No other device gives the flexibility of low cost and high end data collection options for today’s mobile environment. ID-e incorporates a new LED back light technology that gives a smooth bright back light and reduces glare, and surface reflection interference. Daylight exposure from windows is not a problem. 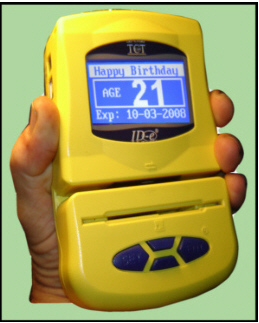 The ID-e2001 Reader is the only dual function Age Verifier fit for C-Store counter top or portable Night club use, and is up-gradable from Magnetic reading only to full 2D reading capability. The 2D barcode reader is able to read wide linear and large 2D bar codes or the smallest micro PDF417 bar code labels found on today’s Driver License. The ID-e2001 ID scanner can save up to 4000 scans in non-volatile flash memory and is safe even with the removal of the batteries or any other power failure. The ID-e2001 unit can be easily customized to read even the most difficult or encrypted magnetic or 2D bar codes used for your business, institution or events. Instant Age, Date of Birth, Expire date. View, Name, Address, Ht,Wt, Eye Color. Review records right in your hand anytime. Software up-grades are easy to install. Reads all USA & Canada ID’s with Magnetic strip. Wall transformer included - AC/DC or AA battery operation. Download data into a Database or Compliance report. Up-grade (see pic # 3 & 4) to read all USA and Canada with the 2D barcode. Snap on 2D reader is easy to upgrade and install anytime. Highly recommended for C-Stores, Clubs, Law Enforcement.